Join us to succeed in Vienna! Sign up to read articles for free and to get personalized updates on the events that interest you. third parties and you can unsubscribe at any time. apple banana find news that contain at least one of the two words. "some words" find news that contain the exact phrase "some words". apple* find news that contain words such as "apple", "apples", "applesauce", or "applet". +apple +juice find news that contain both words. +apple -macintosh find news that contain the word "apple" but not "macintosh". +apple macintosh find news that contain "apple", but rank news higher if they also contain "macintosh". The Vindobona table below is an updated list of National Days of all nations, which belong to at least one of following categories: Foreign Missions and Delegations in Vienna, Austria; Diplomatic Corps and other representations in Austria; International Organizations in Vienna and Permanent Missions; Missions and Delegations to the OSCE. 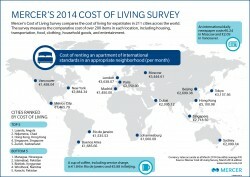 The Mercer's 2014 Cost of Living Rankings have been published and cover 211 cities across five continents. While Western European cities have all risen in the rankings mainly due to the strengthening of the Euro against the US dollar, most cities in Central and Eastern Europe (CEE), however have fallen in the ranking as a result of local currencies depreciating against the US dollar. Bratislava (#84), Prague (#92), Kiev (#98), Ljubljana (#116), Zagreb (#120), Budapest (#135), Warsaw (#142), Belgrade (#184).